The care and understanding of Rhythm and Soul that The James Hunter Six grant to their latest release, Whatever It Takes, show a frontman as the perfect ambassador for the music while his delivery and drive in the songs exhibit a longtime student of Soul. The Vintage Soul of Whatever It Takes champions a time when Soul music was a melting pot of grooves, the rhythms finding their own pace and style. The James Hunter Six rely on one another, each instrument having a moment within the arrangement. Percussion backs James Hunter’s request to ‘have a little faith in me’ in the title track while gentle acoustic strums soundtrack a lonely beach bonfire and the confessions of a man who knows his best comes too late in “I Guess I Should’ve Spoke Up”. Gospel harmonies keep the mantra “How Long” on repeat with a bass heavy beat as Whatever It Takes wrangles James Hunter’s sharp-angled guitar riffs into form guided by persistent organ notes in the instrumental “Blisters”, shuffles some lovers advice with “Show Her”, and percolates on a fast-paced go-go beat with “I Got Eyes”. The James Hunter Six tastefully populate the songs with Soul licks that showcase top-shelf players so confident in their abilities as a band that have no need to grandstand, each melody steered by rhythm, accented with guitar, organ, and saxophone leads that ebb and flow. The James Hunter Six and Daptone co-founder/album producer, Bosco Mann, recorded the album straight to tape at Daptone’s Penrose Studios in Riverside, California. Two albums into their contractual marriage, the British band and Daptone Records prove that they are perfect together. 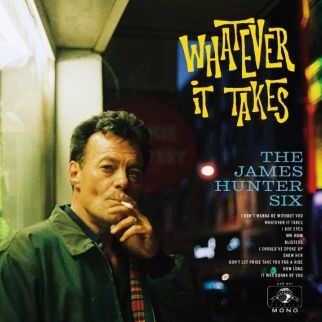 Whatever It Takes follows a snare drum snap to enter the album on the sleek confession “I Don’t Wanna Be Without You” and purrs like a cat on the smooth beat of “Mm-Hmm” as The James Hunter Six issue a warning on a runaway Rock’n’Roll rhythm with “Don’t Let Your Pride Take You for a Ride”.